Only three or four us kept our clothes on; the rest wore pajamas. The women in the blue pajamas brought the drugs and drinks, but you weren’t allowed to have any if you kept your street clothes on. My husband had his clothes on when he went through the door with the blonde-haired woman and came back wearing nothing but a beige, cotton bathrobe backwards. He was lying in a bed and had passed out from the drugs. That’s when they let me see him. After twenty minutes, one of the women in blue shook my husband awake and asked him to fart. Really. I wouldn’t lie about something this serious. She didn’t say pass gas, she said fart. You can’t leave until you do, she said. Then all around the room, people in their backwards bathrobes, rolled on their sides, unveiled their instruments and played the Symphony in B Flatus, also called Flatulence No. 2. I picked out the French horn; a loud, stuttering trumpet; the expressive vibrato of the oboe; the high notes of a violin slightly out of tune and sounding like a creaking door (which happened to be my husband); the staccato beat of a percussionist; and what sounded like the susurrations of the end-blown flute. The symphony had only one movement, but the blue pajama’d people never stopped waltzing around the room, now praising, now encouraging each instrumentalist to keep playing. After the music stopped, they helped my husband into an easy chair and served him drinks. A man in pajamas with his face mask pulled down came over to talk to my husband. This man knew a part of my husband that I will never know. Under the influence of the drugs, my spouse showed that man a side of himself that he has rarely shown anyone, except his mother, many years ago. Oddly, I didn’t feel jealous. However, I grew tired after a while and convinced my husband to put his clothes back on. With my help, he got dressed, but we had to wheel him out to the car. He kept saying he was fine, but he couldn’t remember much of what he had done that morning or what he had said. I decided not to ask too many questions. That’s what happens when you go to one of those colonoscopy parties, so let that be a warning to all of you who are considering going. Drugs make people do strange things, and people who dispense drugs make people do even stranger things, like making you stay at the party until you pass enough gas to fill several helium balloons. The next day my husband was back to normal, although he told me the whole ordeal had left him feeling pooped. I’ve heard that people spend days preparing for those parties, although the idea never really appealed to me. I hope everything came out okay in the end. Yes, dear, it all came out in the end. His, not mine. You are hilarious my dear! Where do you come up with this stuff? I’m glad you enjoyed it, Katherine. My daughter, the nurse, asked the doctor if she would watch my colonoscopy be performed. I agreed, the doctor agreed. Apparently I chatted through the whole thing, but because of the memory block drug, I am not aware of what I said.I don’t think my daughter will choose to be privy to my unabridged observations again. I don’t think I could watch anyone having a colonoscopy; however, I also have a daughter who is a nurse and she would love to watch. I bet you said some very interesting things. Did you ever find out what you said? This is a kind of party I’ve never heard of. Doesn’t sound like too much of a laff riot! Rather than sully your blog, I’ll send it to you via e-mail, and you can decide whether you want to quote it! You have to be on drugs to enjoy it. Who was a magnificent farter. Of the Hayden Octet in B-Major. 2) You use such a light touch with such a potentially heavy topic. That’s the mark of a deft writer’s hand, my friend. You get your point across without pressing down on the page too hard with your pen. Love that. I was surprised when the nurse used the word fart. It’s common enough, but usually in medical settings, nurses and doctors use medical words. I don’t know why but there was something about it all that reminded me of a pajama party. This is a hoot! Not only do nurses say “fart”, they say “pee,” two words my mother never allowed. I remember the mortification the first time I was told to “fart”. At least I was in a private recovery room. Thanks for making this unfun experience so much fun. This is by fart–oops, far–the best colonoscopy procedural I’ve ever read. Clearly your husband had his procedure performed at a very debauched spa, which is really the way to go, so to speak. Absolutely perfectly told! R and I turned 60 and 50, respectively, last year and celebrated by both having our colonoscopic ‘bit of fun’. Getting good Report Cards on the results was merely the trophy–our ‘team’ of servers was superb, and evidently very light-handed indeed with the inflation apparatus for the process–so much so that they could go around among the partygoers afterward, delicately suggesting that it was perfectly permissible to “toot” if one felt the need, but our recovery ward lacked the symphonic beauty you describe entirely. What we did *not* lack, however, was really great relaxation drugs. I am normally quite abstemious when it comes to party entertainments of that sort, but did not hesitate to tell my anesthesiologist afterward that if I changed my attitude about that she would be my first invitee to the next big party I threw. Best ‘nap’ I’ve had in eons! I heard so many kinds of sounds; it’s funny that I tuned into them. And the nurses seemed genuinely delighted when the patients passed gas. Even now when I think about it, it seems like a crazy skit on some late-night TV show. I can just hear you saying that to your doctor. How funny! Given what I say when I am not using conscious sedation drugs, I think I probably sound sane when I’m sedated. You know how folks who work with animals end up going home smelling like horses or pigs or whatever. Would you want to marry one of these nurses? I once played the tuba, in that marching band, oh yeah, I’ve been to that party… And the only reason I go back,,,is for the DRUGS..
No believe me, you didn’t miss anything..Super post as usual. 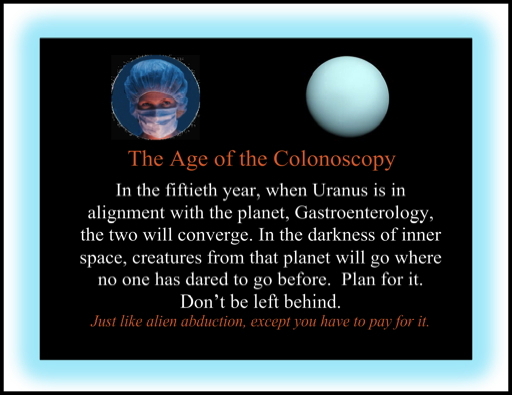 Unquestionably the most entertaining description of a colonoscopy I have ever come across! I found it entertaining because I was not a patient. Brilliant! A classy post about farts. So that’s what happens afterwards…I’m usually so out of it that I miss all the music and they’re sending me home at shift change. The nurses told us they do between 20-30 a day, so it’s a pretty busy place. That’s a lot of wind instruments. Something you and your husband might find amusing: Out there in Interweb Land is a duo named Bowser and Blue, who sing a little ditty titled “Ode to the Colorectal Surgeon”…..mayhap you’re already aware of it? I just looked them up – very funny. Thanks for the tip.